DWS Group (DWS), has entered into a binding agreement to acquire an equity stake of 15 percent in Neo Technologies – a financial technology company through Neo Strategic Holding Limited. Neo Technologies is a first mover in digital asset management solutions in the MENA region, based out of the Dubai International Financial Centre (DIFC). As part of the transaction, a strategic partnership will be formed whereby DWS and Neo Technologies will collaborate on the development and expansion of digital asset management services throughout the region. “By investing into this platform, we further underline our growth commitment into digitization and technology as communicated in the course of our IPO. Neo Technologies enables DWS to obtain further presence in a region with high growth rates in asset management”, said Thorsten Michalik, Member of the Board and Co-Head of DWS’ Global Coverage Group, responsible for the asset manager’s distribution in EMEA and APAC. Neo Technologies operates a platform-as-a-service model for the financial services industry allowing financial institutions to rapidly introduce digital asset management solutions to their end clients. As a white-label solution, Neo provides an integrated front, middle and back office that is built specifically for the MENA region, adapting to local languages and regulatory requirements. Integrations with partner platforms, brokers, and specialist advisors enable clients of Neo Technologies the ability to efficiently scope the services and products they offer to their end users. Through the Neo Technologies platform, financial institutions are enabled to focus on enhancing client relationships. 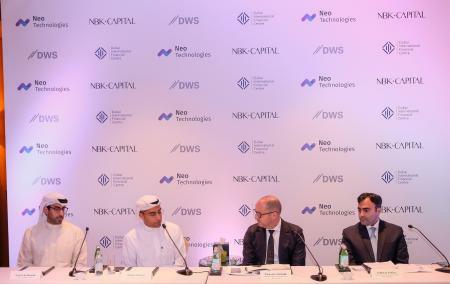 Neo’s team, working with NBK Capital, launched Kuwait’s first digital investment service: NBK Capital SmartWealth. “Technology has greatly evolved investment management and redefined client engagement over the past few years” said Fahad Albader, CEO and Founder of Neo Technologies. “In the near future, platforms with specialized multi-tenant service providers will herald a new era of solutions for the financial services industry. That is why we at Neo Technologies are thrilled to welcome DWS and their capabilities to the platform”. With an expected acceleration of digitization, regulatory oversight, and shifting client demographics in the MENA investment management industry, firms will require to adopt new distribution models, modern technology infrastructure, and specialized services such as investment & risk advisory. The Neo Technologies’ platform provides a proven, regionally compliant solution for firms looking at technology to help shape their business models for the future. The parties agreed to maintain confidentiality on the price of the transaction and further financial details. Closing of the transaction is expected for year-end 2018.